Though many may feel as if mech mods are dying out, manufacturers like iJoy are still pumping out products like this iJoy WonderVape 270 Mech Mod Kit. Take a seat and enjoy this review, where I share a quick briefing of the WonderVape 270 Mech Mod Kit, a detailed close-up viewing of it, and I give you my thoughts as well as how this mechanical mod and RDA pairing performs. Appearance: Though there isn’t too much to go off of when it comes to mech mods, they do have a design to them that typically only mechanical mod users will notice. Some look sleek, some stealth, and some just straight raw to give you just the look you’re gunning for. As for the WonderVape 270 Mech Mod Kit, which combines both the WonderVape 270 Mech Mod and the WonderVape RDA, you get more of a high-end appearance. 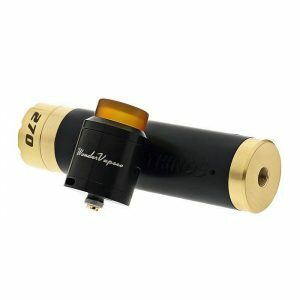 Features: To give you an idea of that high-end appearance it offers, you can expect things like an ULTEM Top Cap, an interchangeable metal sleeve, a 26mm device that’s slightly wider than the RDA to give it a bullet shaped look. However, the features you’ll want to look for is the two post build deck, the PEEK insulator, the gold plated 510 contact, adjustable bottom side airflow control as well as button airflow, the addition of a 20700 3000mAh battery, and my personal favorite, the spin and press fire button that eliminates threading and allows for only a quarter of a turn for removal. Performance: As for its performance, the mech mod, well, it performs like a mech mod. I know many of you cloud chasers that are into these mechanical mods can tell the difference as far as voltage drop and things like that, but to me, a person that isn’t so fond of these safetyless devices, it performs like any other I’ve used. However, the RDA is awesome. The WonderVape RDA offers an incredible amount of airflow, it has those dual barrels that rest right under the coils for enhanced flavor, it has a build deck that’s super easy to build on, as well as an ULTEM top cap that not only looks great, but prevents your lips from burning too.